This is one of the great beef stews of the world. It's a uniquely Hungarian dish that's half way between a soup and a stew. While in Hungary, I learned a couple of things. First, that every cook has a different version of this recipe and second, that everyone believes their version is the most authentic. So to me, that means all versions are authentic as long as they contain Hungarian flavours. This recipe is dedicated to the memory of Ann Szemba, my Hungarian friend who traveled with me to Hungary and taught me this dish. Preheat your oven to 325°F (160ºC) and turn on your convection fan if you have one. For the goulash, heat the vegetable oil in a large Dutch oven over medium-low heat. Add the onions, peppers and garlic and slowly cook without browning, about 10 minutes. Sprinkle in the paprika and caraway seeds and continue cooking at very low heat for a minute or two. Toss in the beef, carrots, red wine, bay leaves and salt. Continue cooking just to bring the works to a simmer, then transfer to the oven. Cover and bake until the beef is tender, about 3 hours. Stir in the vinegar. For the spaetzle, whisk together the flour, cornstarch, salt and pepper in a large bowl, evenly distributing the finer powders amidst the coarser ones. In another bowl, whisk together the eggs and milk. Pour the liquids into the dry mix and stir, forming a firm sticky batter. Rest the works as the elastic batter relaxes improving tenderness, and the flour absorbs the moisture improving chewiness, 15 minutes or so. Fill your largest pot with lots of hot water, lots of salt and lots of heat. Bring the works to a boil as the spaetzle batter rests. Position a colander with large 1/4” (1/2 cm) holes over the boiling water. Transfer some or all of the relaxed batter into the colander and use a rubber spatula to force it through the holes into the simmering seasoned water below. The spaetzle cook very quickly. They’ll sink then almost immediately float to the surface when they’re done. Stir gently so they don’t stick together. Strain them out with a slotted spoon and repeat with any extra batter. If you don’t have a colander, try a standard box grater held on its side. Load it with batter and rub the works back and forth over and through hits largest holes. 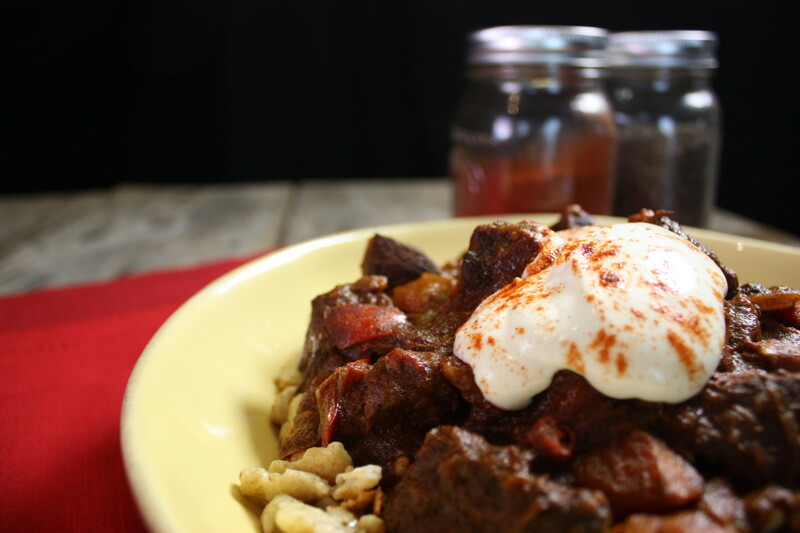 Divide the spaetzle between serving plates, top with the goulash and serve with a dollop of sour cream. 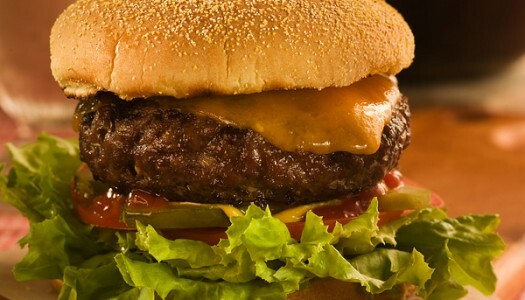 The humble hamburger can easily be elevated to the heights of cuisine classics with the same attention to detail that any dish deserves. It can also be infinitely varied with lots of your personalized flavours. Ground chuck is your best choice because it has a higher fat content than ground round or ground sirloin. 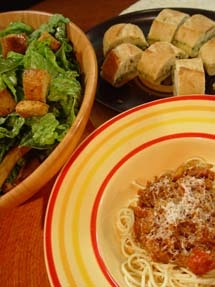 If you’re a home cook you need a good meat sauce recipe up your sleeve. This is one of mine. Its secret is that I don’t brown the meat. That way it doesn’t toughen and need hours of braising to tenderize again. I also use a food processor to save a lot of knife work. Quick, easy and tasty!